First Blood Diamonds, Now Blood Computers? When the film Blood Diamond came out in 2006, people were startled at the alleged origins of the precious stones from areas of bloody conflict and began asking whether the jewels on their fingers cost a human life. Will consumers soon find themselves asking similar questions about their cell phones and computers? 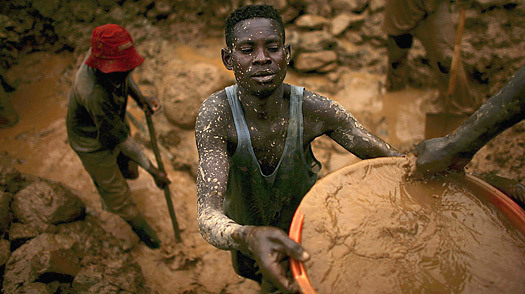 In a report released earlier this week, Global Witness claims that multinational companies are furthering a trade in minerals at the heart of the hi-tech industry that feeds the horrendous civil war in the Democratic Republic of Congo . However, the accused companies, with varying degrees of hostility, deny any culpability, saying Global Witness oversimplifies a complex economic process in a chaotic geopolitial setting. The provinces of North and South Kivu in the eastern DRC are filled with mines of cassiterite, wolframite, coltan and gold  minerals needed to manufacture everything from lightbulbs to laptops, from MP3 players to Playstations. Over the past 12 years of armed conflict in the region, control of these valuable natural resources has allegedly become a lucrative way for warring parties to purchase munitions and fund their fighting. The Global Witness report claims to have followed the supply chain of these minerals from warring parties to middlemen to international buyers. According to Global Witness, although the Congolese army and FDLR rebel groups have been warring on opposite sides for years, they are collaborators in the mining effort, at times providing each other with road and airport access and even sharing their spoils. Researchers say they found evidence that the mineral trade is much more extensive and profitable than previously suspected: one Congolese government official reported that at least 90% of all gold exports from the country were undeclared. And the report charges that the failure of foreign governments to crack down on illicit mining and trade has undercut development endeavors undertaken by the international community in the war-torn region. The study, Faced with a Gun, What Can You Do, raises questions about the involvement of nearly 240 companies spanning the mineral, metal and technology industries. It specifically fingers four main European and Asian companies as open buyers in this trade: Thailand Smelting and Refining Corp. , British Afrimex, Belgian Trademet and Traxys. And it questions the role of others further down the manufacturing chain, including prominent electronics companies Hewlett-Packard, Nokia, Dell and Motorola. Even though the companies may be acting legally, Global Witness criticizes their lack of due diligence and transparency standards at every level of their supply chain.